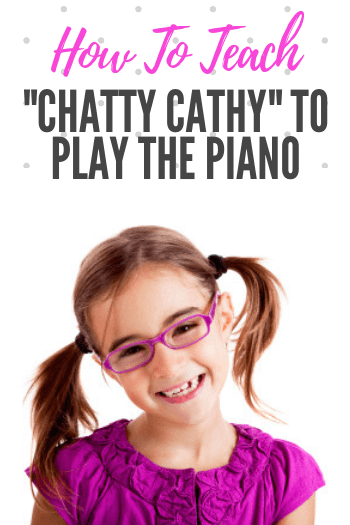 Chatty Cathy needs to see exactly everything that needs to be accomplished in her piano lesson in order to stay on track. Have a large chart displayed with the lesson tasks (ie. ear training, learn new piece, review old pieces, sight reading etc.) clearly set out. Go one step further and let her check off each task as it is completed. When you notice she is getting off track, this visual is a way to gently remind her of everything you have left to do. Print a FREE visual lesson chart here (scroll down to Level 1+ resources). A large part of Chatty Cathy’s desire to keep chatting is to gain some positive reinforcement from you. Make a point of remembering things she has told you in the past. The fact that she has been heard (and that you cared to remember) will help her to realize that she doesn’t need to tell you everything every single lesson. Her chatter is born out of a desire to get your attention. Show her she has it. Chatty Cathy finds tidbits of information about you to be quite thrilling. Let her get to know you by sharing interesting parts of your own life in between piano tasks. If she gets a satisfying “read” on you each lesson, she’ll be less likely to spend gobs of time plying you with questions, desperate for a connection with you.